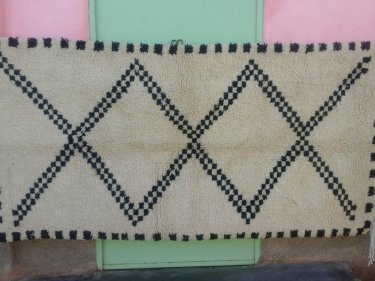 Pile knot rugs, or zrbya rugs in Ait Hamza, are plush warm rugs, and are one of the most popular carpets that the association weaves. 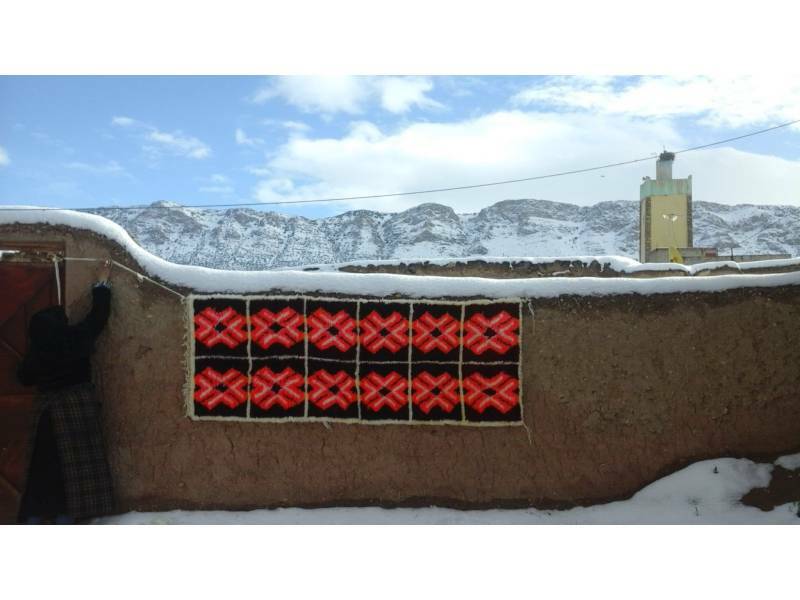 The designs and color reflect the culture and nature that define Ait Hamza. In many Tazrbit carpets that the association produces, letters from the Tifinagh alphabet (Berber language) can be found within the designs as well. 1991Dh: This price includes shipping within Morocco. To order, e-mail us at hello@theanou.com and we will help you with payment options. 1991Dh: Le prix inclut la livraison au Maroc. Pour passer commande envoyez nous un message à l'adresse hello@theanou.com et nous vous présenterons les différentes options de paiement. Want to visit Association Tithrite in person? The cost is $10 USD per person, all of which is donated to the cooperative. Visits include tea, snacks and work demonstrations! Fill out the form below and we'll send you additional details and payment options when artisans confirm your time. Fatima is 32 years old and she is divorced. She is born in Goulmima and went to school there. She ... show more Fatima is 32 years old and she is divorced. She is born in Goulmima and went to school there. She dropped out in middle school. She learned sewing in “La Maison des Jeunes” which is a social and educational center located in her region. 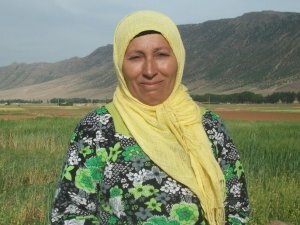 The center’s mentors taught her the techniques of sewing and now she has got a diplomat in sewing. Her specialty in the association is sewing and she looks forward to bright future. She likes to travel a lot. 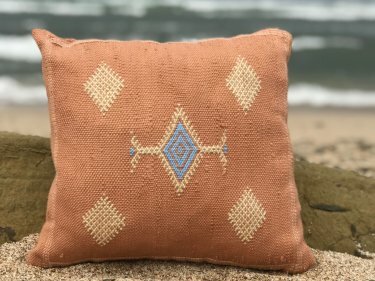 The warp of this item is made from cotton thread. 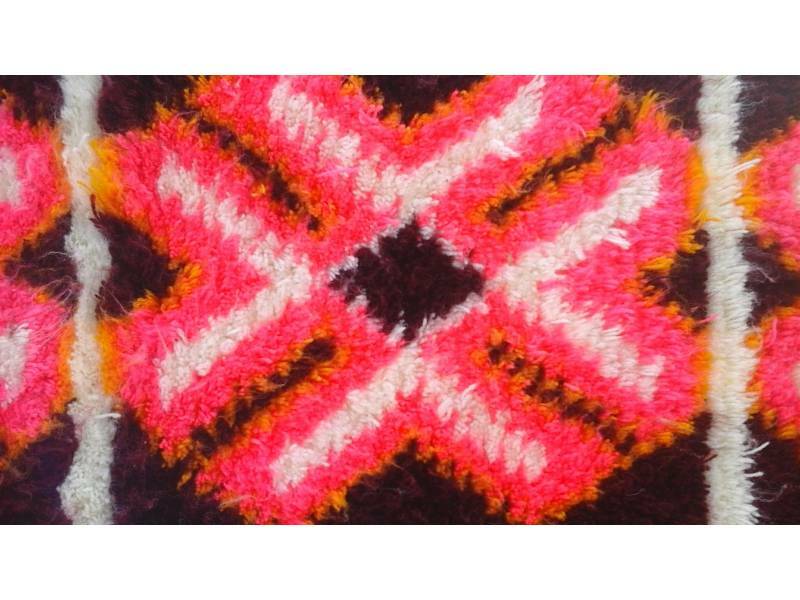 show more The warp of this item is made from cotton thread. 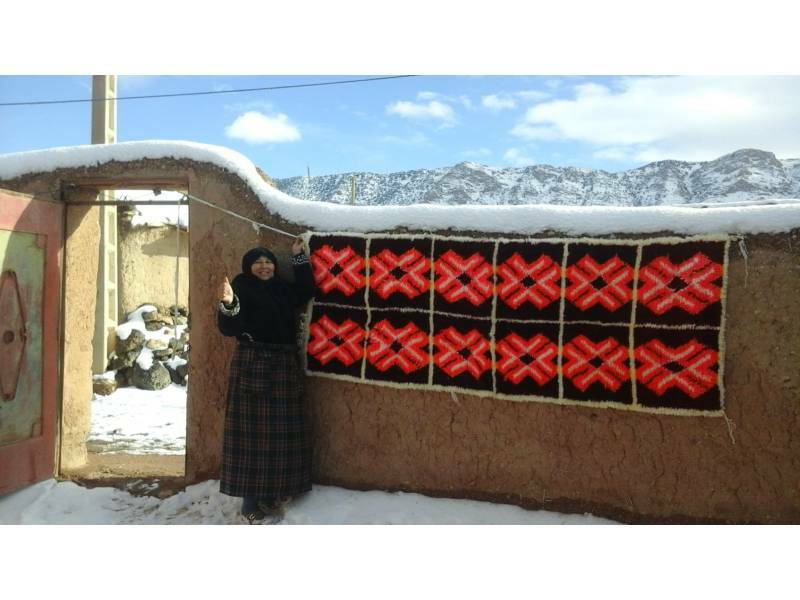 The wool in this product is sheared from sheep in Ait Hamza. 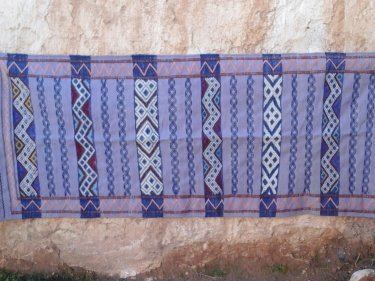 Wool from Ait ... show more The wool in this product is sheared from sheep in Ait Hamza. 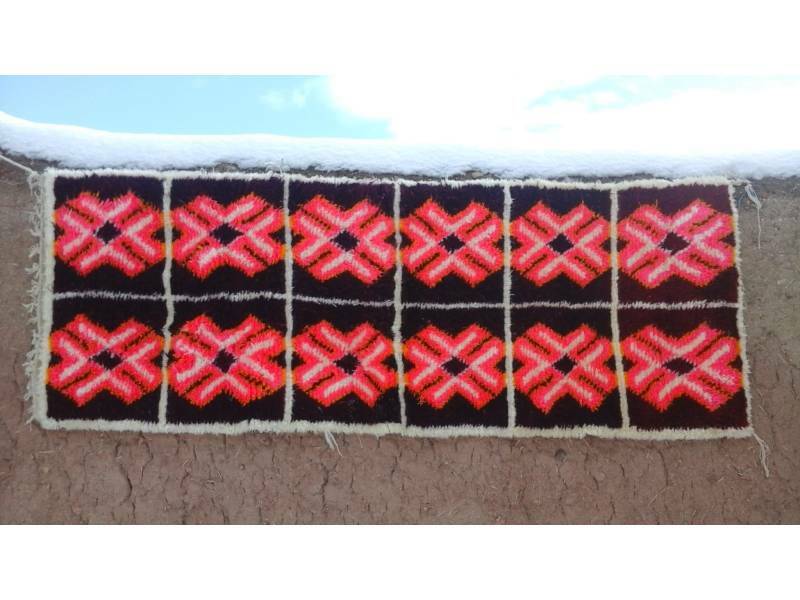 Wool from Ait Hamza is widely regarded as one of the finest wools in Morocco. It is strong, durable, and is difficult to rip even its pre-woven state. This carpet was made with a specific blended cotton and wool thread that is synthetically ... show more This carpet was made with a specific blended cotton and wool thread that is synthetically dyed. 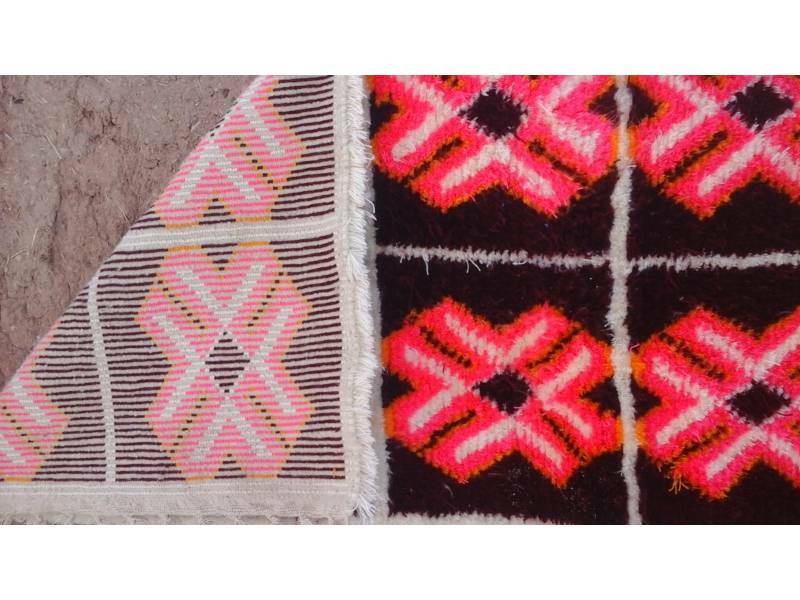 The colors are specific to the carpets produced in Ait Hamza and its surrounding villages. The vertical loom is used to create many of the cooperative's rugs. There are many ... show more The vertical loom is used to create many of the cooperative's rugs. There are many looms at the cooperative and are all thought to have baraka, or special powers.